Chef Ressul Rassallat (L'Orangerie, The Lodge at Pebble Beach) has opened his first restaurant in West L.A., Tapenade. Not only that, he designed and built it himself. Expect a rustic, global menu of small plates built around fresh California market ingredients, such as crispy Brussels sprouts with almonds and capers; grilled squid with tomato, beans and chorizo; lamb shank for two; and the signature dish --- ricotta tapenade with crunchy miniature loaves of rosemary bread. Lunch and Dinner Mon.-Sat. Tapenade, 11301 West Olympic Blvd., Los Angeles, CA 90064, 310-312-6233. Lenny Rosenberg, a second generation deli owner from New York, launched his newest location of Lenny's Deli in Westwood February 7. The restaurant replaced the famed Junior's Deli, which closed last year after 53 years. Rosenberg has noted his great respect for the memory of Marvin Saul, the founder of Junior's Deli, and states that he wants to bring the traditions of the classic deli into the 21st century, with more healthy options and lower prices. Breakfast, Lunch & Dinner daily. Lenny's Deli, 2379 Westwood Blvd., Los Angeles, CA 90064, 310-475-5771. Mr. Chow has opened a branch at the Malibu Country Mart in the former Nobu Malibu space. This is the second Los Angeles area location of the famous Chinese restaurant, joining Mr. Chow in Beverly Hills. Mr. Chow, Malibu Country Mart, 3835 Cross Creek Rd., Malibu, CA 90265, 310-456-7600. Chef David Myers (Comme Ca) has opened Hinoki & the Bird at The Century luxury condominium building in Century City. The menu features Asian-inspired dishes such as coconut-curried mussels; lobster roll with green curry and Thai basil; and caramel-braised pork belly with radish and mustard greens. Hinoki & the Bird, 10 W. Century Dr., Los Angeles, CA 90067, 310-552-1200. A second location of Hostaria del Piccolo has opened. This branch of Santa Monica's casual Italian restaurant Hostaria del Piccolo is part of The Frank, a new mixed-use complex in Venice. Hostaria del Piccolo, The Frank, 512 Rose Ave., Venice, CA 90291, 310-392-8822. Michael Sutton, Sandy Gendel and Peter Garland have opened Sirena in the former Pane e Vino space in West Hollywood. The menu features coastal Mediterranean dishes. Sirena, 8265 Beverly Blvd., West Hollywood, CA 90048, 323-852-7000. Chef Paul Shoemaker has opened Juicy Lucy, a burger joint at TASTE at FIGat7th in downtown. The menu offers burgers (with the cheese inside of the meat, rather than on top), sriracha cheese fries, and shakes in flavors like chocolate, mixed berry and salted caramel. 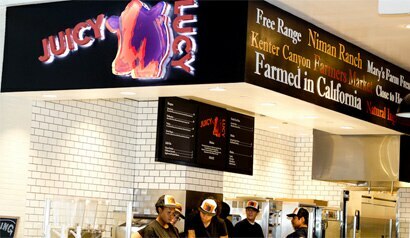 Juicy Lucy, TASTE at FIGat7th, 735 S. Figueroa St., Ste. #120, Los Angeles, CA 91107, 213-683-1030. Look for a springtime opening for M.B. Post chef-owner David LeFevre's new Manhattan Beach seafood restaurant Fishing With Dynamite. The former Water Grill chef revisits the East Coast fishing nostalgia of his childhood with a raw bar menu including oysters, crab and sea urchin, as well as cooked seafood fresh from the waters of Alaska, Maine and Chesapeake Bay. Fishing With Dynamite, 1148 Manhattan Ave., Manhattan Beach, CA 90266, no phone. Berlin Currywurst became a hit in Silver Lake two years ago with its spicy Berlin-style sausages; now they've opened a sudsy sister spot in Hollywood: Berlin Currywurst - The Beer Garden. Expect all-natural pork, beef, chicken and tofu wursts with a range of curry sauces from mild to hot. Plus wine, with German craft beers on tap and in bottles. Lunch & Dinner daily. Berlin Currywurst - The Beer Garden, 1620 N. Cahuenga Blvd., Los Angeles, CA 90028, 323-467-7593. On Rodeo Bistro & Lounge at Luxe Rodeo Drive Hotel in Beverly Hills features French fare with a California twist from chef Olivier Rousselle, and cocktails created by Matthew Biancaniello. On Rodeo Bistro & Lounge, Luxe Rodeo Drive Hotel, 360 N. Rodeo Dr., Beverly Hills, CA 90210, 310-273-0300. The Blind Donkey, a new bar from Ryan Sweeney (Little Bear and The Surly Goat), has opened in Old Pasadena, showcasing a rotating roster of local craft beers and a particularly wide selection --- more than 60 at last count --- of bourbon and rye whiskeys that are incorporated into some clever cocktails. There's also bar food, like triple-fried fries with Sriracha ketchup or grilled cheese on a skewer with tomato soup for dipping. Open nightly. The Blind Donkey, 53 E. Union St., Pasadena, CA 91103, 626-792-1833. Former Rustic Canyon Wine Bar & Seasonal Kitchen and Milo & Olive chef Evan Funke will soon be opening a pasta-based concept called Bucato in the former Beacon space at Culver City's Helms Bakery complex. The restaurant will include a pasta lab where Funke will be making pasta the old school Bolognese way, without any machines, extruders or rollers. The menu will feature eight to 10 handcrafted pasta dishes, as well as seasonal small plates prepared on a wood-burning grill. The 100-seat restaurant will feature an abundance of reclaimed woods and two patios. Bucato, Helms Bakery, 3280 Helms Ave., Culver City, CA 90034, no phone. The Hudson in West Hollywood reopened January 17, following a makeover after owners Beau Laughlin and Brett Cranston temporarily closed for renovations and to reformulate the menu. The collaborative effort, designed to make The Hudson a more inviting experience, was conducted by chef Conrad Woodul, mixologist Mia Sarazen, interior designer Jeanmarie Dumouchel, and Riley Rea, an expert in reclaimed wood, from Croft House Furniture. The Hudson, 1114 N. Crescent Heights Blvd., West Hollywood, CA 90046, 323-654-6686. At D'Cache, the Spanish/Latin-fusion eatery in Toluca Lake, new executive chef Phillip Lee has unveiled a modern Spanish menu to show off his stuff. At lunch, the five-course menu is priced at $35 ($45 with wine), and at dinner, a 10-course tasting menu runs $65, (or $95 with wine). D’Cache, 10717 Riverside Dr., Toluca Lake, CA 91602, 818-506-9600. Taking place over two consecutive weeks (January 21–February 1), this winter's dineLA Restaurant Week offers diners the opportunity to indulge in specially priced menus from a variety of LA restaurants. Meals will be available in three price categories: lunch menus for $15, $20 or $25 and three-course or small plate dinner menus for $25, $35 or $45 (beverages, tax and gratuity are not included). A.O.C., the popular wine bar that pioneered the small plates concept in L.A., served its last meal in its current location on January 19, 2013. The restaurant, owned by acclaimed chef Suzanne Goin and business partner Caroline Styne, will re-open on February 6, 2013, in the building that housed Il Covo, at 8700 West 3rd Street in West Hollywood. Dinner nightly. A.O.C., 8700 W. Third St., Los Angeles, CA 90048, 310-859-9859. Alex Stratta has moved on from his shuttered Alex at Wynn Las Vegas, to become the new executive chef at Scarpetta in Beverly Hills. Stratta is replacing Freddy Vargas, who is leaving to helm the stoves at SBE's Mercato di Vetro. Scarpetta, Montage Beverly Hills, 225 N. Canon Dr., Beverly Hills, CA 90210, 310-860-7970. Benjamin Dayag has been named the new chef de cuisine at L'Ermitage Beverly Hills' restaurant Livello. Dayag, who succeeds Joseph Elevado, was promoted from executive sous chef. "My passion is to create classic dishes that embrace modern cooking methods, while staying true to time-honored techniques," says Dayag of his contemporary American cuisine with Asian influences. Dayag has cooked extensively in Las Vegas, at Nobu and Social House, before arriving at L'Ermitage Beverly Hills. Livello, L'Ermitage Beverly Hills, 9291 Burton Way, Beverly Hills, CA 90210, 310-278-3344. Jon Shook and Vinny Dotolo (Animal, Son of a Gun) are teaming up with Ludo Lefebvre (LudoBites) on a new restaurant. The name and concept have yet to be determined. Animal, 435 N. Fairfax Ave., Los Angeles, CA 90036, 323-782-9225. After more than 50 years in business, Henry's Tacos in Studio City closed in January. Henry's Tacos, 11401 Moorpark St., North Hollywood, CA 91602, no phone. BoHo, the bohemian gastropub at Hollywood & Highland, has closed. BoHo, Hollywood & Highland, 6801 Hollywood Blvd., Ste. 411, Hollywood, CA 90028, no phone. SIMON L.A. at the Sofitel Los Angeles has been turned into Estérel, a Mediterranean-influenced restaurant. SIMON L.A., Sofitel Los Angeles, 8555 Beverly Blvd., West Hollywood, CA 90048, 310-358-3979. The Royce at The Langham Huntington, Pasadena had its last night of full service on January 26, 2013. The kitchen will be renovated and the restaurant will change concepts to a New American steakhouse. Chef David Féau will be moving on, but has not yet announced where. The Royce, The Langham Huntington, Pasadena, 1401 S. Oak Knoll Ave., Pasadena, CA 91106, 626-585-6410.